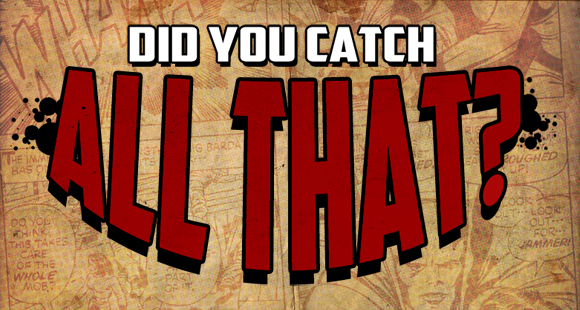 It’s time for a brand-new August episode of Did You Catch All That?! This time around we’re shooting at Comic Smash in Studio City California and let me tell you we have a great show! We talk about how amazing Valiant Comics is and both Simon and Sheldon talk about a Valiant book on their segment of We’ve Got Issues.We also tell you what hardcover came out this past month and it is BIG as it weighs in over 9 1/2 pounds! Speaking of that there’s a trivia question where you can win your very own copy of Scott Pilgrim’s Precious Little Life number one..just watch the show. That’s not all though we talk about the big summer events from all your favorite publishers. Sheldon breaks down the biggest news in entertainment for the past month. Simon talks to you about one of the greatest independent comics ever. So go make yourself some popcorn and enjoy this amazing nonstop action-packed summer blockbuster that we like to call Did You Catch All That? Spider-Men #4 of 5 by Brian Michael Bendis with art by Sara Pichelli. Archer & Armstrong #1 by Fred Van Lente and art by Clayton Henry.